The streets of urban Toronto are vastly different from our ride so far. Our route from Orillia had been tough, with hills and busy highways to negotiate, but today’s ride to Burlington, on the western side of Lake Ontario, was fantastic. The first half being entirely on bike paths and the second, on roads with a bike lane. This meant we could relax and enjoy the ride and the scenery around the lake. We got away early and had little effort making it down to the waterfront and onto the Martin Goodman Trail. We stopped for photos in front of the 553m CN Tower, Toronto’s tallest structure before heading off down the trail to look for a coffee. Incredibly, there’s no coffee to be found around the lakeshore for some stretch. It wasn’t until we had reached Humber Bay Shores until we found a place selling coffee. Understandably, it was pretty busy, so we sat outside and took a break even though it was a bit windy. Our route took us parallel with Lake Shore Boulevard and through some very affluent areas, especially Oakville and Burlington itself. The real estate here must be astronomical and no expense is spared on the houses, some of them sporting up to 5 garages! We had cycled to Burlington to try out our legs on a longer ride and to give us a smaller day tomorrow. We have another housesit in Dundas, just 20kms away, so it will be an easy day and better to judge our arrival time. We arrived at our Airbnb house at Burlington around 4 pm. The owner, a Dutch guy, was just arriving home. He settled us in and we got cleaned up. The house was fantastic and just a small way back from the lakefront. The house was full of memorabilia from his numerous trips to Africa. As we had no food, we wasted no time in walking the 3kms back into town to the Queen’s Head, an English style pub with great pub grub. We were both pretty tired after our long day and decided it would be better to get a taxi back. We dawdled our way over to Dundas but were still way too early to go to the housesit. So, after a brief look around the main street, we sat in the beer garden of the Thirsty Cactus and ordered lunch and a few beers. With the fully loaded bikes leaning against the fence in front of us, we were attracting plenty of attention from the locals who were all curious to know what we were doing. Having just started our journey, there wasn’t too much to tell, but the conversation flowed with tales of travel and the fact we lived in Vietnam, a fact that fascinated everyone. For these guys, we were true adventurers, a rare species in these parts apparently! 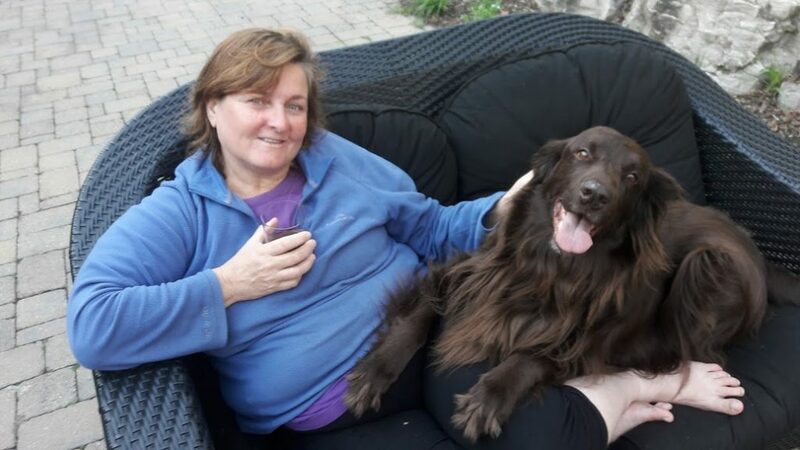 After a short but steep ride up a big hill to the LCBO to stock up on some drinks for the night, we headed over to Michelle’s place to meet her and her dog Hugo, who we’d be sitting for the next 10 days. Michelle is English and would be flying back home with her son the next day while we minded her house and dog. The days past rapidly and were beginning to warm up. It was nice to be outside now, so I thought I’d do a few chores around the yard for Michelle while Shazz worked on her writing assignments. It took me 2 days to clean her front drive of leaves (it’s a pretty big area) and then I set about fixing her waterfall/pond which hadn’t worked for some time apparently. After cleaning all the leaf sludge out of the pond, I checked all the electrical connections. Sure enough, a loose connection was fixed and the pump began working once more. I refilled the pond with clean water and let the filter do the rest. It was an awesome sight to see it running and we’d sit around in lounge chairs next to it each night and enjoy the serenity with Hugo. 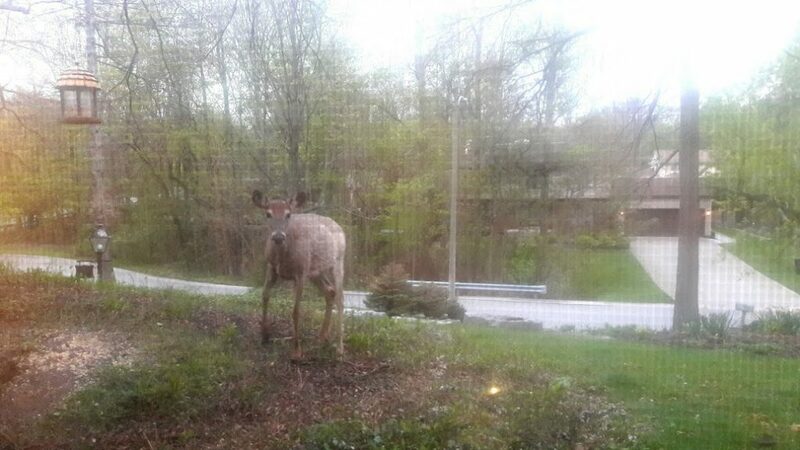 We were fortunate enough to have our friend Teresa visit again. She’d taken us out and about while we were in Port Severn and now she came and got us and took us to dinner in Hamilton and showed us her investment property. We had met Teresa on the yacht in the Caribbean a couple of years before and she had visited us in Saigon and again in Sri Lanka earlier this year. She’s a great girl and has invited to come and stay with her at Crystal Beach on Lake Erie. We awoke to a light rain that appeared to be easing. Our route today took us on a bike path out of Dundas to Hamilton and up and over the escarpment, the same escarpment which forms Niagara Falls. The rain eased up as we left Michelle’s house and made our way uphill to the bike path. I had written out a route using Google Maps the night before and we were now following it through the Hamilton back streets looking for the start of the Escarpment Rail Trail. The trail rises ever so slowly from Hamilton to Albion Falls on top of the escarpment and keeps you out of the busy city area around the lake. Once up top, visibility was poor due to a thick fog, it all looked pretty grim. We called into a McDonalds for breakfast. A timely stop as just as we sat down the skies opened up and it began to bucket down. We waited it out for about 40mins and then made our move. Unfortunately, roadworks had blocked our route and we had to cross a muddy embankment to get around them. We spent the next 30mins digging clay out from under our mudguards and chains – not happy! The bikes were a mess and we didn’t look much better, but we figured it’d all come out in the next rain shower. 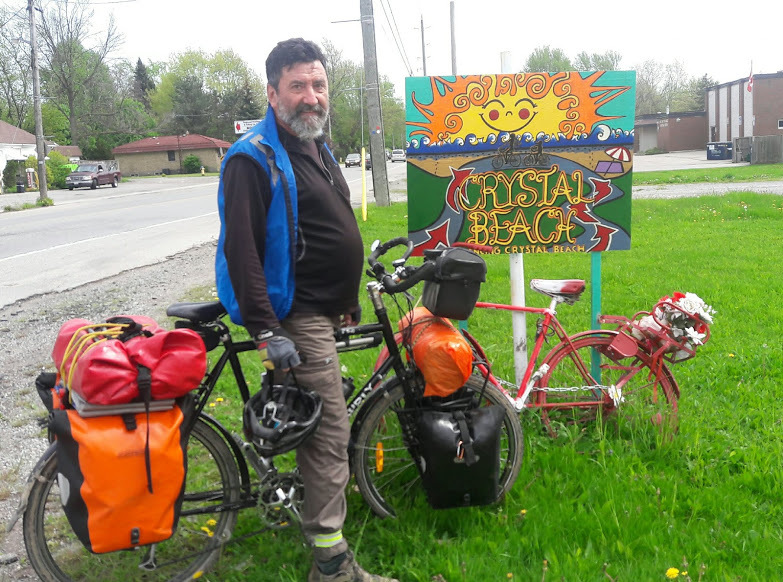 Heading south, we rode against the wind for the next 40kms until we hit the Grand River and turned towards Dunnville. The scenery got instantly better. The ride south wasn’t very memorable! At Dunnville, we found the local pub and stopped for a bite and a beer. 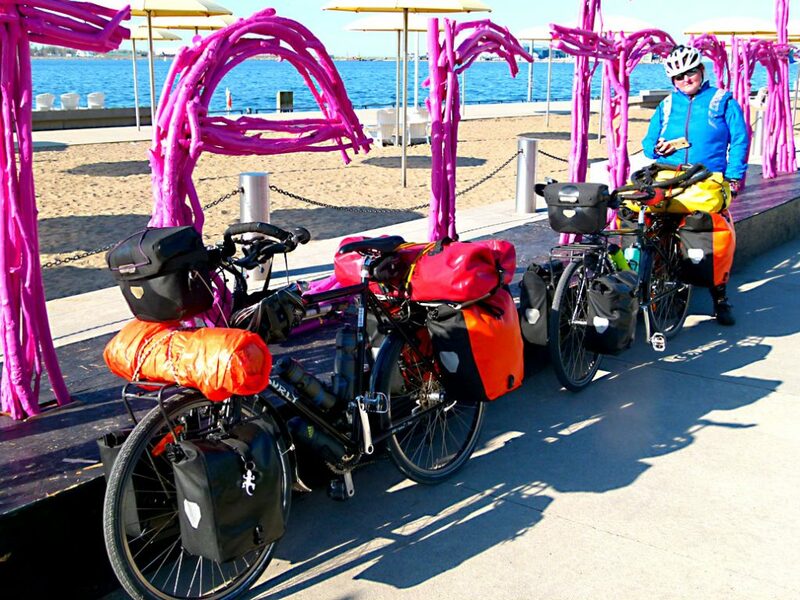 We talked with a few locals, one who had walked across Canada twice! They were all farmers and we were invited to pitch our tents in one of their fields outside of town, but we had already booked a campsite across the river at the Byng Island Conservation Area. As it was a public holiday long weekend (Victoria Day), all the campgrounds had banned alcohol, so off we went for a dry night for a change. I’m sure the locals paid no attention to the rules as they were quite rowdy all night anyway! Highway 3 began with a nice, wide shoulder, which made us very happy, but after a while it began to narrow out, not so happy anymore! We were making good progress though, so we decided to stay on the 3 all the way to Port Colborne. That’s when things got really exciting. We had followed the flow of traffic to a swing bridge over the inlet that bisects the town. The Main Street Bridge has a serrated grate for a roadtop, unlike any other bridges we’d crossed! We were on it before we could do anything about it. Keeping control of the bike and not tipping over was really difficult, and scary. If we fell off the serrations on the grated surface would rip us up pretty badly. Fortunately, with much care, and a bit of luck, we wobbled across to the other side and got immediately off the road to let the rest of the traffic through. Looking back at the bridge, I should have seen a walkway on one side which allowed pedestrians (and cyclists) to cross. Oh well, lesson learnt! 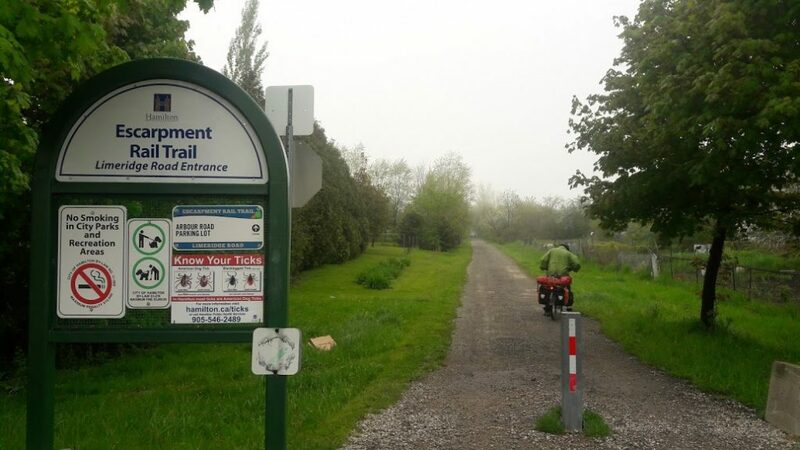 We followed Highway 3 out of town and turned south onto a rail trail, it was part of Ontario’s Great Trail. It’s quite flat and featureless but it served us well for the last 12kms into Crystal Beach. The Welcome sign at Crystal Beach! We spent the next 3 days with Teresa at her shack in the tiny village. She’d done a lot of work on it, and although it is quite small, she managed to fit us in and even got the bikes into her garden shed. That night we went to her local pub, The Crystal Chandelier for dinner and drinks and listened to some live music, which was pretty damn good. She’s friends with the owners, so we got to meet a few people. It was a good night, we hadn’t been out with other people for a while. Crystal Beach on the shores of Lake Erie, it must be Summer! The next day, Teresa showed us around town and took us down to the beach. 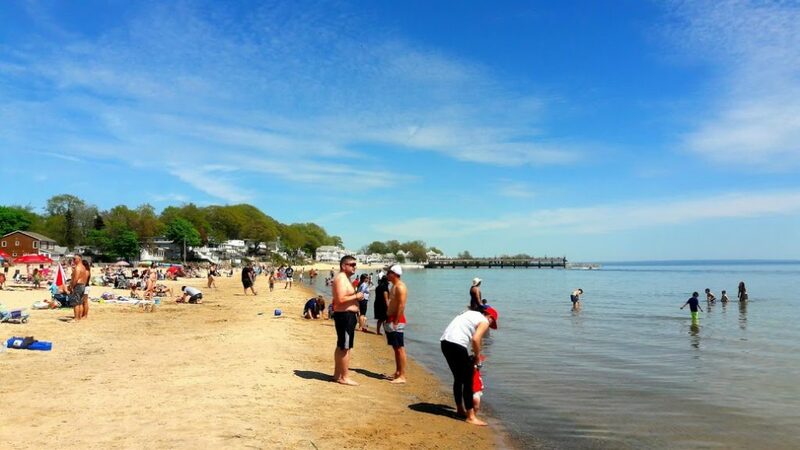 It was a sunny day and the shoreline of Lake Erie was lined with hundreds of people in their swimsuits sunbaking and frolicking in the water. Shazz and I looked decidedly out of place, all covered up in warm clothes. It was still way too cool to be swimming at the beach for us, I shuddered just thinking about it. These Canadians are a hardy lot! 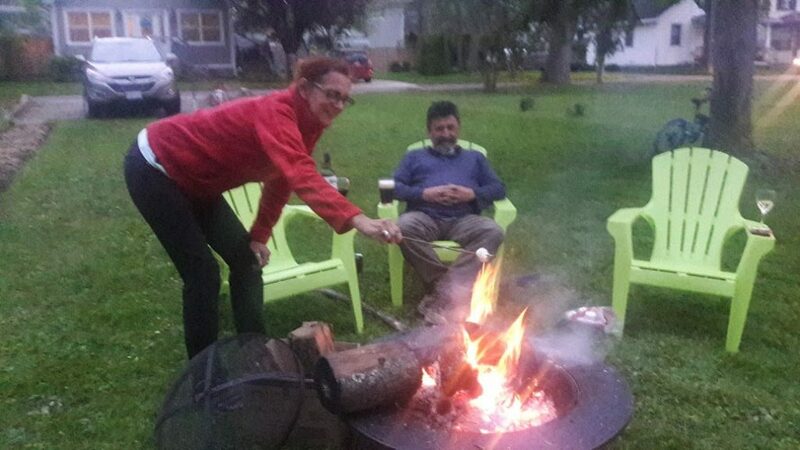 Before it got dark we lit the fire bucket in the front yard and sat back with few beers while Teresa toasted marshmallows. It was great to sit around a fire once more, it had been way too long. The mansions lining the foreshore are all owned by Americans who come over from Buffalo for their holidays. Crystal Beach used to be something like Brighton in England, with a huge amusement park and paddle steamers to bring people over for the day. Those days have gone, but the Americans stayed and joined the Golf club or the Tennis club or the Yacht club, anything exclusive. 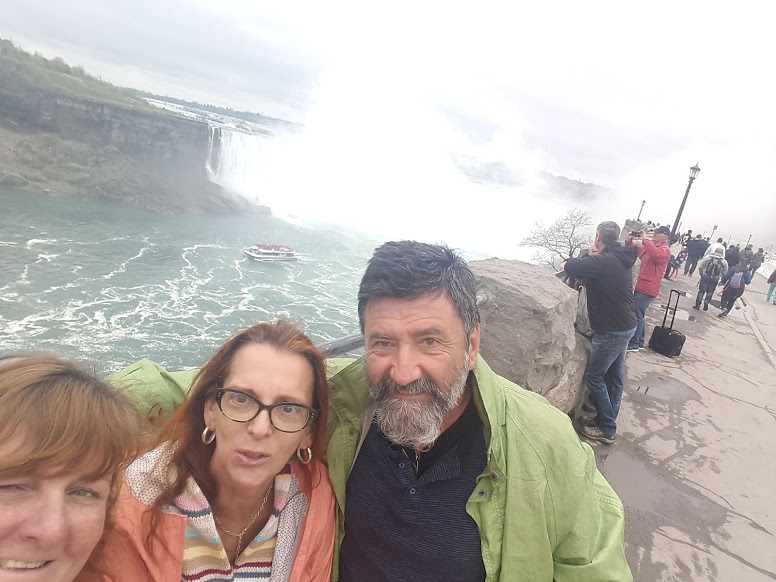 Teresa, Shazz and I at Niagara Falls. Spectacular and popular! On our last day with Teresa, she drove us up to Niagara Falls. It was an overcast day but the falls are so impressive, it didn’t matter. There were thousands of people on the Canadian side, the best side to see the falls, and the boats that ferried people right up to the base of the falls were all full as well. The spray cloud arising from the base of the falls reminded me of Victoria Falls in Africa, it was massive. The falls empty out into Lake Ontario, the water eventually making its way out to the Atlantic via the St. Lawrence Seaway. No visit to Niagara Falls would be complete without a few hours at the Casino, and that’s exactly what we did! Having donated our share to the poor owners of the establishment, we headed back to Crystal Beach and got the fire bucket going again. This was our last night in Canada, tomorrow we’ll be in the States for our first time (all going well at Immigration), it’s been a blast Canada, we love you!